Figure 1. 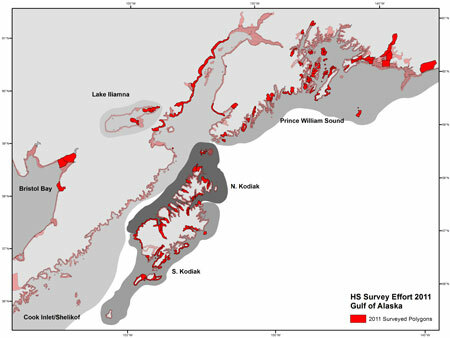 Harbor seal survey extent in 2011. Genetically distinct stocks are labeled and the red line indicates the survey area of approximately 4,000 nmi of coastline. 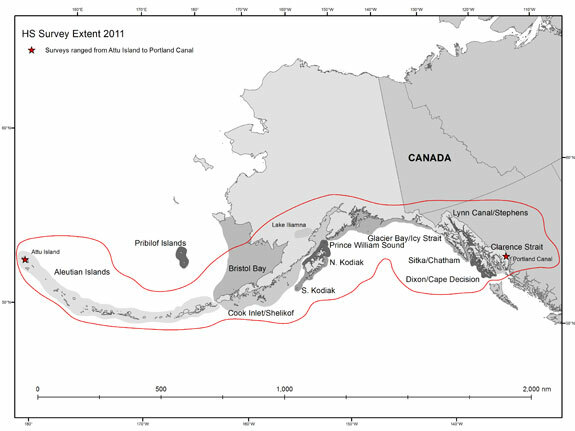 The NMML's Polar Ecosystems Program (PEP) is responsible for monitoring and estimating the abundance, trends, and distribution of harbor seal populations in Alaska, which range from Southeast Alaska through the extent of the Aleutian Islands and north into Bristol Bay. The PEP conducts aerial surveys of harbor seals every July and August. This is one of the largest regularly occurring wildlife surveys in the world. The 2011 surveys ranged from Attu Island (172ºE) in the western Aleutian Islands to Portland Canal (130ºW) in Southeast Alaska—a straight-line distance of approximately 2,000 nmi and roughly 4,000 nmi of coastline (20,000+ nmi of tidal shoreline) (Fig. 1). We utilized six aircraft, including three NOAA DHC-Twin Otters and three single-engine floatplanes from local charter companies. The scientific crew consisted of PEP scientists and support personnel from NOAA's Aircraft Operations Center. Figure 2. Harbor seal survey effort for the Gulf of Alaska in 2011. Figure 3. Harbor seal survey effort for Southeast Alaska in 2011. The 2011 surveys also included efforts to monitor the population and trends of harbor seals that rely on tidewater glacier habitats, which support the largest known aggregations of this species in the world (e.g., >5,000 seals in Icy Bay). Biologists photographed seals hauled out on ice in tidewater glacial fjords using a three-camera, forward-motion-compensating camera system mounted in the belly port of a NOAA DHC-Twin Otter. Seals in these fjords are scattered across often enormous fields of floating ice that shift with currents, making the seals particularly difficult to count. Fjords with larger ice fields are photo-sampled along transects, and seal distributions are estimated using spatial models. Methods developed in 2010, of creating mosaics to get complete counts of smaller fjords, were tested again with positive results. Tidewater-glacier habitat surveys are timed to overlap with the peak abundance of seals hauled out on ice, which typically occurs between 1300 and 1700 hours. Glacial fjords surveyed in 2011 included Icy and Disenchantment Bays in the Gulf of Alaska; Tracy Arm, Endicott Arm, and LeConte Bay in Southeast Alaska; and College Fjord, Barry Glacier, and Bering Glacier in the Prince William Sound area. 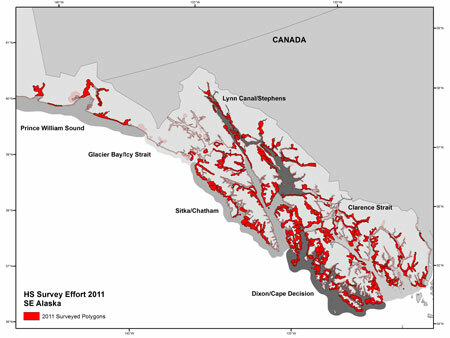 Most of the glaciers surveyed are in a phase of rapid retreat, which paradoxically increases the area of calved ice and habitat for seals while getting closer to the point where the glacier will ground and no longer provide habitat for seals, as has already occurred in Glacier Bay and elsewhere. Images collected in both terrestrial and tidewater glacier habitats are geo-referenced and counted. Counts are adjusted to account for seals that are in the water (i.e., not hauled out on land or ice), which provides us with the necessary data to estimate total abundance of the harbor seal population on an annual basis.